Mercifully, our little patch is remarkably immune from attack by plant pests and and diseases. The last two winters have put paid to the aggressive lily beetle, not so cunningly disguised in its bright red armour. Many a morning have I ventured into the garden to pick off and squish these highly visible bugs, which have a knack of dropping to the ground at the slightest movement. Apart from these, the greenfly, mildew, leafcutter bees, thrips and our enormous, greedy wood pigeons are only minor nuisances, and so far none have caused much mischief this year. That cannot be said for public enemy no. 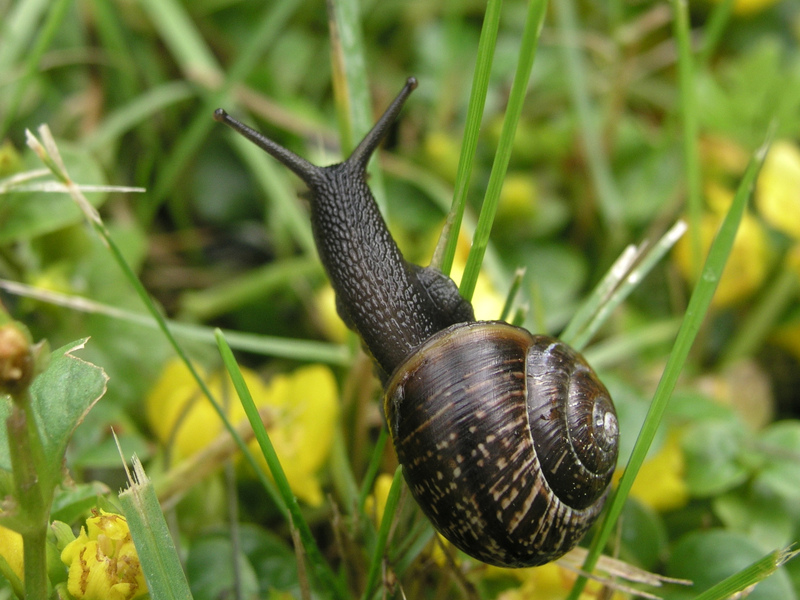 1, the common garden snail, which seems to regard our garden as the culinary equivalent of The Fat Duck, or Le Manoir. Every year, we wage war on these slow but wily creatures, which multiply like rabbits (fortunately we never have to witness this process), and rejoice in this cool, damp weather. Last year, I memorably collected over 100 of the little thugs in a bucket and carried them down the street to a drain, from whence I hoped they would either meet their maker or retire to someone else’s garden. Two hours later, we witnessed a procession of snails making their way up the lane, and back into the garden via the front gate. Very polite, but not quite the result I was hoping for. So, despite trying to take the “eco” alternative wherever possible, these little blighters are thwarted by one thing, and one thing only – the slug pellet. They may be blue, unsightly and toxic, but in the end they do the job. I worry constantly about poisoning the wild birds we try so hard to encourage, but somehow they manage not to go near them. Of course, a substantial number of snails survive my murderous antics, only to cause damage to stems, leaves and flowers. I noticed today that a swat team had managed to strip the surface layer off several lily and allium stems, making them susceptible to breaking in the strong winds. So, the battle continues – I have stopped growing a number of plants the snails find particularly delicious (namely Nicotiana and Dahlias), but as the ginger lilies and Cautleya finally emerge from the ground I can almost hear the blighters plotting their tactics for the next round….